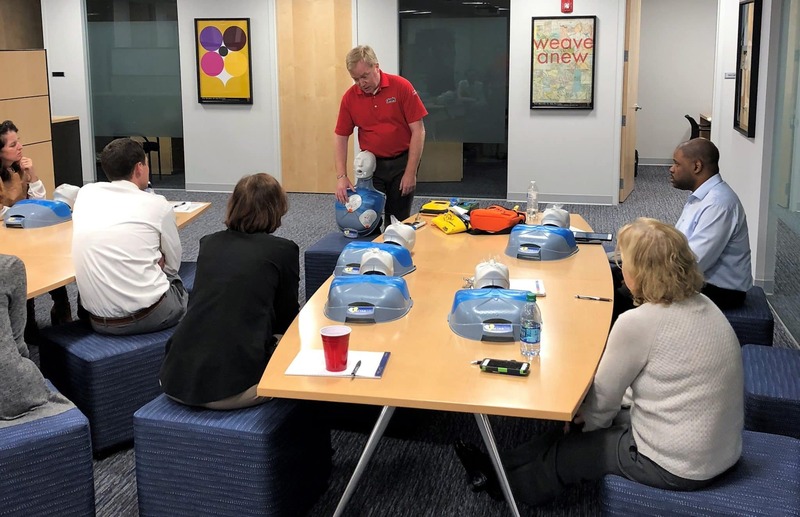 As part of its long-standing commitment to the health and safety of our employees, Adviser Investments recently offered on-site American Heart Association-certified training in first aid and cardiopulmonary resuscitation (CPR). Whether reviewing previous training or taking the class for the first time, several members of our team completed highly instructive online courses reinforced with live instruction. According to the U.S. Occupational Safety & Health Administration, around 10,000 people experience cardiac arrests in U.S.-based workplaces every year. Remarkably, more than 350,000 cardiac arrests occur outside of a hospital setting each year in the United States; sadly, 90% of those victims do not survive. There is a way to dramatically increase those odds! The American Heart Association emphasizes that prompt CPR administration can double or even triple those survival rates, and approximately 45% of the heart-attack sufferers who receive immediate CPR outside of a hospital setting survive cardiac arrest. These statistics speak for themselves and motivated Adviser Investments to sponsor this potentially life-saving training, which also included instruction in proper administration of our office’s automated external defibrillator (AED) device. Congratulations to all of the Adviser Investments employees that completed and renewed their Heartsaver First Aid/CPR/AED certification!